If you have questions about the program, contact the Program Director, Dr. Mark Lawrence, at accountingcompletion@una.edu or call 256-765-4332. Registration is underway for Summer 2019 classes. Summer classes will begin on Wednesday, April 3rd. Completed applications and payment will be accepted through Sunday, June 30, 2019. Coursework will need to be completed by July 26, 2019 to receive a grade for the summer semester. Grades will be released no earlier than early August regardless of completion date. Take up to nine 3-credit hour accounting/business law courses. The courses offered are those that are commonly required by states to sit for the CPA Exam. All courses are offered online to meet the demands of your busy life. 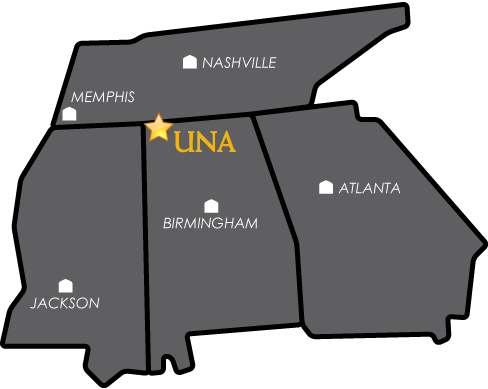 All courses are taught by full-time faculty at UNA using state-of-the-art instructional technology. These faculty are available to provide guidance and feedback as you complete the course requirements. Tuition is $545 ($525 plus $20 Continuing Ed fee) per 3-credit course, which includes the costs of all electronic study text materials. Meet the prerequisites for the course. For more details on the content of these courses, see the course descriptions. Click here for information on obtaining a Badge in Professional Accounting. The courses offered as part of this program are provided by the University of North Alabama (UNA). UNA is accredited by the Southern Association of Colleges and School (SACS) and the UNA College of Business is accredited by the Association to Advance Collegiate Schools of Business (AACSB).